This holiday season are highlighting some of the wonderful patients that The Genesis Foundation is lucky enough to support at The Feingold Center for Children. Here is Katie’s story! When I was 18 weeks pregnant with my daughter, Katie (now 17 years old), my late husband and I discovered that Katie had Down syndrome. For the first year of Katie’s life, she was seen at Children’s Hospital in the Down syndrome clinic. We were living in Waltham and with 3 young children within 3.5 years, we found it challenging to get in and out of Boston for appointments. A women in your Down Syndrome support group told us about Dr. Murray Feingold. She told us he had an office in Waltham and she told us how wonderful he was. She told us about how he coordinates medical appointments with other specialists. This sounded very appealing to us because trying to coordinate Katie’s appointments, my son Frank’s early intervention appointments, and being involved in my oldest daughter Mary’s adoption playgroup and seminars proved to be very overwhelming. Katie’s first appointment with Dr. Feingold at the National Birth Defects Center (now The Feingold Center for Children) was on October 12, 1999. This day was also my late husband and my 8th anniversary and my daughter Mary’s 4th anniversary of her adoption day!! A very positive day for us! I was very impressed and comforted when Dr. Feingold spent time asking Allan and me how we were doing. He asked if we felt we were getting support from Katie’s pediatrician, her Early Intervention Center and from our family and friends! We continued to see Dr. Feingold every 6 months and then every year. At each appointment he would spend time with Katie and talk directly to her. He would do magic tricks and joke with her. He would then always ask Allan and me how we were doing and if we were getting support from her school and pediatrician. I was deeply moved when after my husband died, Dr. Feingold asked how I was doing and acknowledged that I have a tough job being a single parent. He expressed his condolences on several visits following Allan’s passing. Dr. Feingold always gave Katie positive attention and praise for what she is doing for activities and for being a dedicated student. I went to Dr. Feingold’s memorial service in October and I was laughing and crying, just as Dr. Timothy Johnson said we would in his opening remarks. To hear from others how he touched their lives, I sat there and thought, “yes, I feel the same way”. 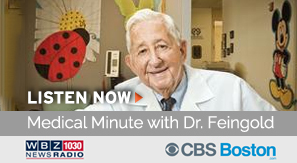 Dr. Feingold was a truly gifted man who shared his gifts/talents with so many. He has left his mark on us families with children with disabilities. To have your daughter get excited to go to the doctor’s when she had an appointment with Dr. Feingold… that says it all!! Dr. Feingold has impacted my life and the life of my daughter, Katie. Katie is not afraid to go to doctor appointments. She enjoys asking questions and touching the medical equipment (which she learned was okay to do when at Dr. Feingold’s appointments; touching his stethoscope and hammer) Dr. Feingold taught me to advocate for my daughter in the schools and in the community. He taught me that the parents are the ones who know their children best and that our voices should be heard. I’ve learned to let my voice be heard in a kind and caring way… something I learned from observing Dr. Feingold. Dr. Feingold is missed but will not be forgotten! We hope you will be heartened that Dr. Feingold’s dream of helping all special-needs children reach their potential will endure. Please help us keep his legacy alive and support Katie and other families that benefit from the services and compassionate care provided by The Feingold Center. Please make your gift today by clicking here! Take a look back at the patients we featured from The Feingold Center for Children during our Year End Annual Appeal.